BlackJack is a card game for two or more players, but in this version, it's just the user versus the computer. The core of the game consists of the BlackJack (game) class, Player class, Deck class, Card class, and a Count utility class. 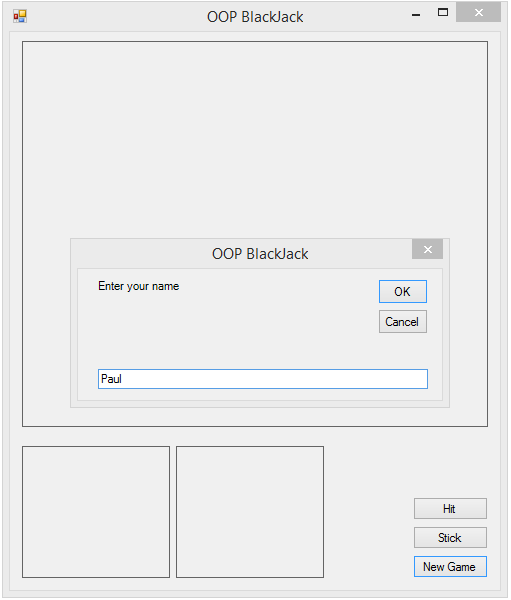 BlackJack class: A new instance of this is instantiated in the GUI Form_Shown event after the user has entered their name. This class contains NewGame, hit, and stick methods with Public Access, as these are the methods called from the code behind the GUI. The class also contains a Private Access play method. The hit, stick, and play methods work together, recursively prompting the user to hit or stick while the user holds a valid hand (i.e. below or equal to 21). Sticking or busting, when the user has first move passes play to the computer, which must keep hitting while its hand' sum is below 17. 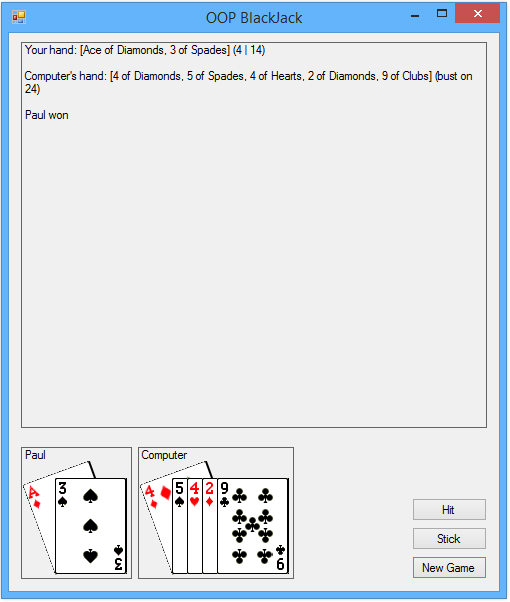 When both players have stuck or bust, the computer's hand is revealed. Occasionally when the computer has the first move, it can bust and the user wins by default. If the user has first move and busts, the computer wins by default. Player class: The user and the computer are both represented by instances of the Player class which has name and hand Properties as well as a hasStuck Property and a getHandAsString Function that returns a textual description of the hand. Deck class: This holds the List(Of Card) that represents the deck of cards. It has createDeck, shuffleDeck, and deal methods. Card class: Each card in the deck is represented by an instance of this class. It has suit, facevalue, and image Properties that describe and depict the card. Count class: This is a utility class that contains five Shared Functions used in scoring and determining the winning hand. The GUI consists of a Form containing a Label for textual output, two handViewer UserControls that display the hands pictorially, and three Buttons used in gameplay. 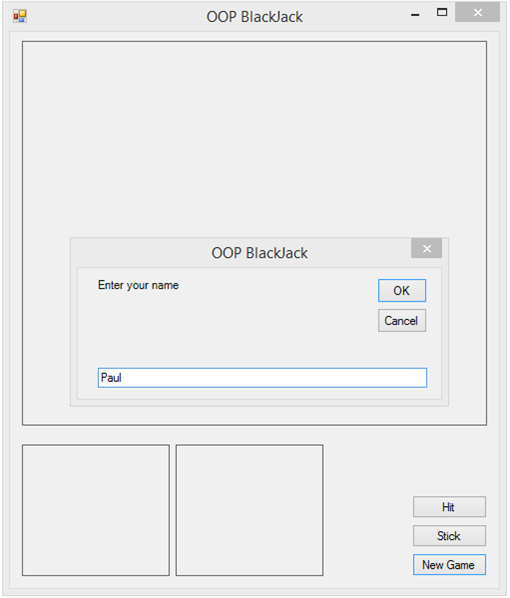 In this game I've reused my InputDialog class which requests the user's name. handViewer UserControl: This is a simple control that displays the player's name and shows their hand pictorially. There are two of these controls, one for each player.